Does the Dentist Know if I Floss or Not? You might be diligent about brushing your teeth twice a day every day, but do you also floss? Many people avoid flossing because they find it to be uncomfortable or time-consuming. However, it isn’t something you should skip. 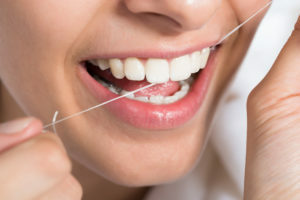 Flossing every day can protect your gorgeous smile and give you a great clean feeling. Plus, it’ll make sure you don’t get a lecture from your dentist the next time you go in for a routine checkup. You can try to fool yourself into thinking that brushing and rinsing your mouth is enough to prevent cavities and bad breath, but you would eventually find out just how wrong that assumption is. Your toothbrush cannot thoroughly clean the tight spaces between your teeth. Tiny particles can get stuck in there and cause gum inflammation and tooth decay. The bacteria that collects there can also lead to bad breath. The fact is that not flossing is just plain gross. Neglecting this part of your oral hygiene routine can mean that you’re not cleaning up to 40 percent of your teeth’s surfaces! Obviously, your dentist will be able to tell if your habit of not flossing has led to cavities between your teeth. However, even if the problem hasn’t reached that point yet, your dentist and dental hygienist will still be able to tell in a second whether you’ve been flossing. They’ll be able to detect the plaque and inflammation between your teeth even if you brushed and flossed right before you went in for your appointment. If you haven’t been flossing, prepare yourself for a friendly and concerned lecture from your dental care provider. If you’re struggling to adopt a daily flossing habit, use the following tips to modify your routine and get those teeth clean! Give yourself a visual reminder. Put your floss somewhere it’s visible instead of in a drawer. That way, you’ll see it every time you head into your bathroom to brush your teeth. You might even put some bright colored tape on it to make it stand out. Focus on the positive. If you hate flossing, concentrate on all the good it does for your teeth! You’ll be able to feel proud of your gorgeous, clean, healthy smile. Reward yourself. After you floss every day for a month, give yourself a treat. Go out for a dinner and a movie, spend a few hours at a spa, or buy yourself that new gadget you’ve had your eye on. Try a water flosser. Many people find that a water flosser is easier to use than traditional floss. It’s worth a try! Flossing is one of the best things you can do for your teeth, so be sure to make it part of your daily routine. The team of dentists at Brooks Dental provides a range of dental services to folks in Winthrop. They always encourage good dental habits and are passionate about helping patients have healthy smiles. If you have questions about oral healthcare, please contact our office at 617-846-1811. Comments Off on Does the Dentist Know if I Floss or Not?